The PowerTye EXTREME Duty Cargo Net net is our top-of-the-line cargo net for the most demanding cargo securing needs. Featuring super-strong 6mm bungee mesh in a 3"x3" tight mesh, this is designed to hold down large, heavier loads safely and securely. Net includes 20 Large Latch Hooks that can be moved around as needed - Hooks fit over bars up to 1" diameter, and each hook includes an easy grab loop to make setup and removal a breeze. Latch hooks help keep net from tangling during use, or while in storage. 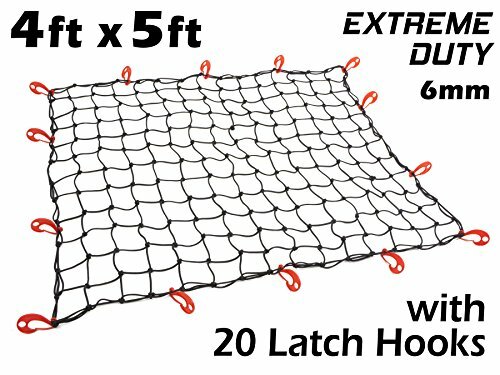 4ft x 5ft EXTREME Duty Cargo Net - Stretches up to approximately 72" wide x 90" long (5ft x 7½ft). Great for Roof Racks, SUVs, Truck Beds, Trailers, RVs, or wherever you need to hold down a lot of cargo! 4" x 4" Mesh holds cargo evenly and securely. Made with premium extra-thick 6mm Latex bungee material for superior durability and longevity. Stretches farther and stays elastic longer than bargain nets made of regular rubber. Includes 20 Large Latching Hooks. Hooks fit over bars up to 1in diameter, and each hook includes an easy grab loop to make setup and removal a breeze. Latch hooks helps keep net from tangling during use, or while in storage. PowerTye Hook Guarantee - If any hooks on our 4ftx5ft Extreme-Duty Cargo Net break during normal use, contact us on Amazon for free replacement hooks. If you have any questions about this product by Powertye, contact us by completing and submitting the form below. If you are looking for a specif part number, please include it with your message. Strong Hand Tools UD65 Light Duty Utility Clamp, 6.5"